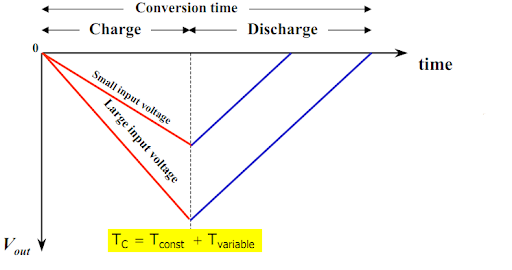 Principle: Dual slope integrating type digital voltemeter has both +ve and -ve slope during integration there by it averages the errors (or) noise that are present in the environment. Operation: The start pulse resets the counter to zero, the flip flop gives zero output and keeps switch Si closed and Sr open by switch driver circuit .The integrator integrates in +v direction when zero crossing just exceeds zero. The gate is open allowing the counter to count the oscillator clock. When counter resets to maximum count for the next clock, the counter resets to zero forcing the flip flop output to '1'. In this case, switch Si is open and Sr is closed. Vr (reference voltage) is negative reference,now integrated by the integrator with negative slope and the voltage crosses zero,the zero crossing detector closes the gate, stopping the counter. 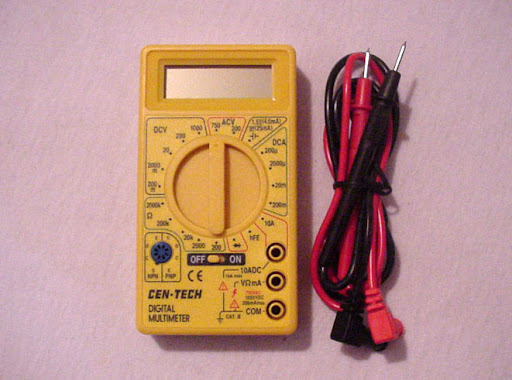 The counts in the counter is proportional to 't2' ( time for integrating Vr (negative slope) towards zero ) and is in-turn proportional to input voltage. Hence, Vi is directly proportional to n2. u did a good job for all of us... thank you very much... u have written in such a way that every one can understand all the concept very easyly.